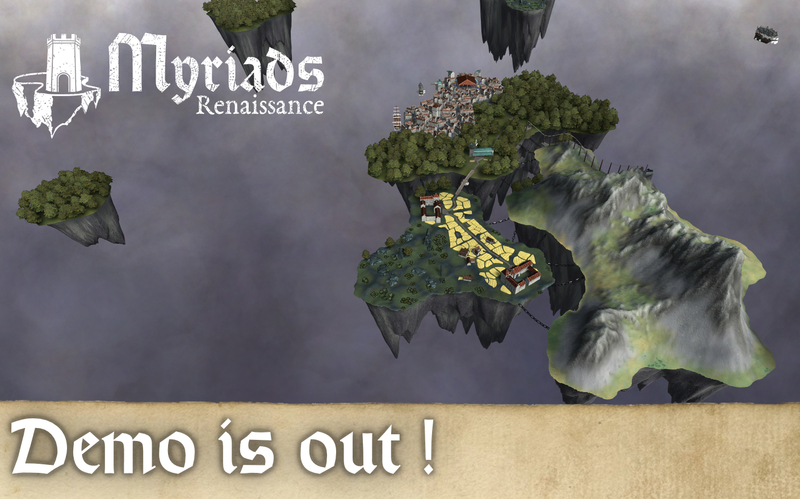 Myriads: Renaissance is a turn-based strategy game with city-building and tactical mechanisms. Set in a low fantasy world made up of thousands of floating islands, build your kingdom the way you choose : conquer, trade or machinate. After months of development, we're happy to share the first demo of Myriads: Renaissance with you! The game is still under development and the demo only covers the city building and management part. You will be in charge of a capital-island. Manage its resources and population, and develop it by aggregating island's shards of various biomes and sizes. Large parts of the gameplay are still to be added as well as the post-process. If you have any kind of critic, advice or if you find a bug, please post a comment. All feedback are welcome! You can also follow us on Twitter and Facebook . Myriads: Renaissance is a turn-based strategy game with city-building and tactical mechanics. Set in a low fantasy world made up of thousands of floating islands, build your kingdom the way you choose : conquer, trade or machinate. If you have any kind of critic, advice or if you find a bug, please post a comment. All feedback are welcome! The demo only covers the city building and management part of Myriads: Renaissance. All feedback are welcome.